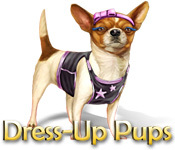 Rated 4 out of 5 by mrm2006 from Match 3 in all Sorts of Ways While Dressing Up Those Pups! A dog owner comes into the Shop (Dress Up Pups) and discusses with you (the proprietor) how the dog should be dressed and/or accessorized. You give the ok and then you're off! There are 2 modes of play - timed and relaxed. I played on relax. The graphics are hand-drawn cartoony but they're meant to be that way. Then the games begin. 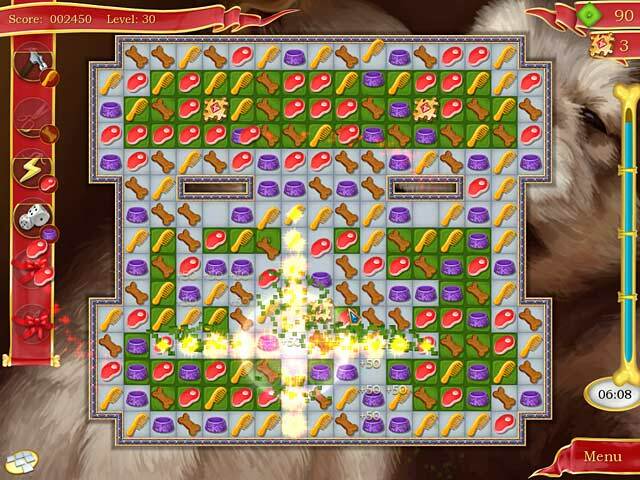 You play match 3 games of various sorts (swap, group and string) and when you complete the level you get 2 or 3 jigsaw puzzle pieces. 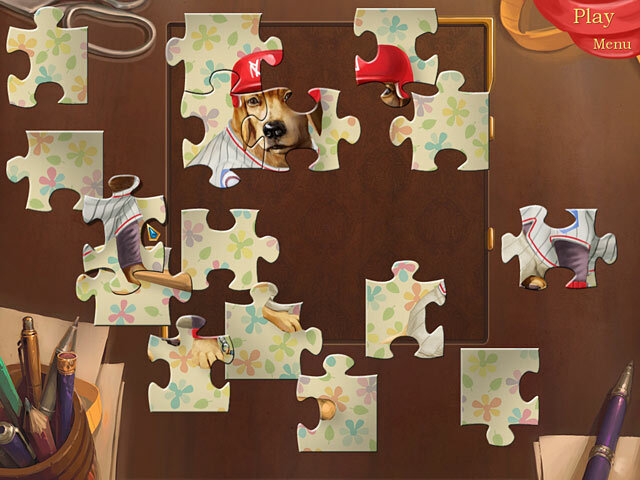 Put those pieces together to unveil the "dressed up pup". In the meantime, between levels, there are pictures of the cutest pups you've ever seen. Now, a few things about the game I didn't like. I don't like any other type of match 3 except swap. I don't have the dexterity or flexibility to do "string" and I don't care for "group". So, I wish we had the choice of which game we wanted to play as we earned them all. I wish we could at least pick out SOME of the items the pup is going to be dressed up in. It seems a shame that all we get is a cartoon picture of it all done up as the computer dictates. Unfortunately, because of those reasons, this will not be a purchase for me but I recommend the game to match 3 lovers, jigsaw game lovers, animal lovers - well, I guess that covers a lot of people - lol. Happy Gaming! Rated 3 out of 5 by PuffleJulia from Dress up Game with No Dress Up Match games are fun, but disappointed that you were not able to buy items to dress up the animals. The game was fine otherwise. I only did trial version, but will not purchase full version as it was really no more interesting or exciting than any other match game. Rated 2 out of 5 by SpookyPigdog from original but left me flat This game has alot of interesting gameplay in the match 3 component; but really that's all it is. The title is misleading; you don't get to dress up pups like Fishdom or Fish Shop 2 - its all pre-set. Perhaps a good game for the kids, but otherwise quite boring after a while. 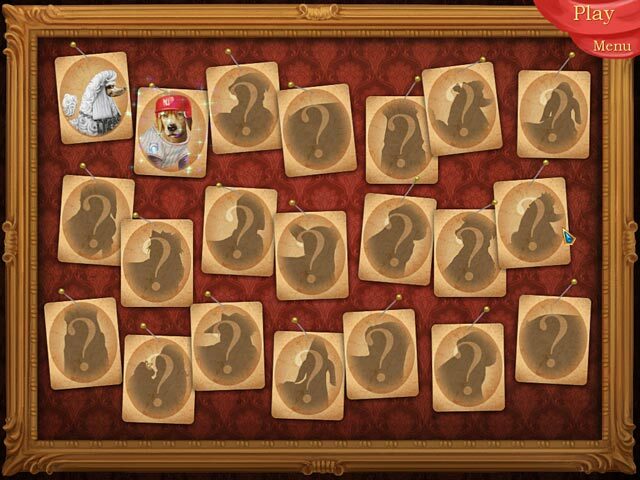 None of the squares are animated (except when they are selectable in some games) or little pooches either. I expected so much more.